If there were ever a time to brighten up your home, it's these dark, dreary days of winter. Read on for five super simple, cost-effective ways to take your space out of the February darkness and into the light. Expand your curtain rods to give a few inches beyond the window frame on either side. This will not only make windows appear bigger, it will also ensure that when you draw back the curtains, they don't block any light from getting in. In addition to maximizing window width, mounting the braces slightly above the window will give the illusion of height. 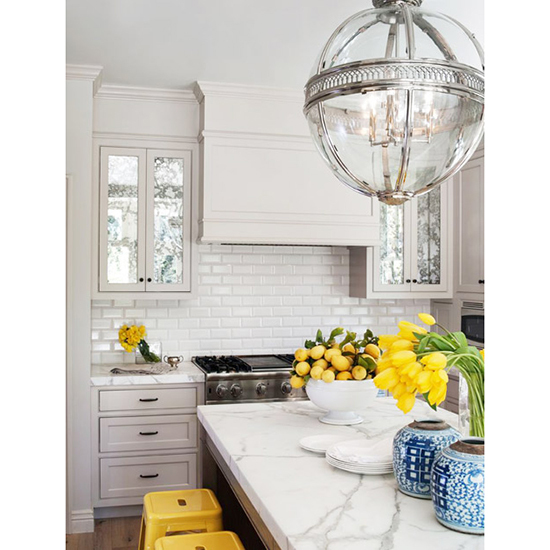 Trade dingy yellow-tinged bulbs for bright white alternatives and your space will look so much fresher. Lightbulb appearance is measured on a kelvin, or K, scale—and the higher the kelvin number, the whiter the glow will be. For your cleanest ambience, look to counts between 3500 and 4100 K.
Nothing brightens up a space like a fresh coat of light paint. Naturally, a white coat will cause light to bounce around the most, but a soft neutral like pale dove gray works great as well. Opt for a gloss with sheen (satin or eggshell) for optimum light disbursement. How often do you clean--not dust, actually clean—your light fixtures? Yeah, we thought so. Washing down your sconces, chandeliers, etc. will rid months and months of dirt accumulation and shed way more light on your space. Make cleaning them regularly a part of your routine. Sure, screens keep bugs out--but they also collect dirt and block light. Try removing your screens seasonally since a) it isn't mosquito season and b) your windows probably aren't open all that often right now. When you get back the daylight (and the mosquitos return) in the summer months, simply swap them back in. And it couldn't hurt to give the glass a good cleaning while you're at it.